BOOST – The smallest and lightest portable power you can find today! 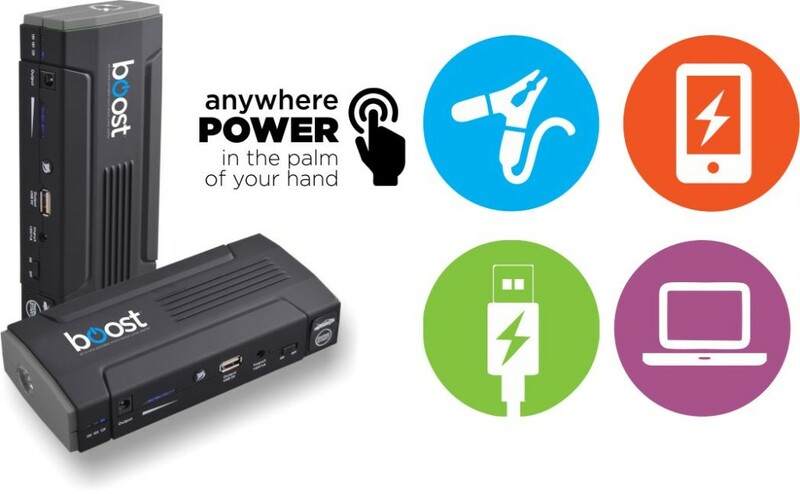 With the BOOST jumpstarter, you have a durable and compact power supply available anywhere! It provides a convenient emergency jumpstart on any 12V vehicle battery and can recharge your mobile phone, tablet, GPS, or laptop. 12 Volt Jump Start for cars, diesel cars, trucks, marine, motorcycles, and more. 1 – 4 liter gasoline cars. 1 – 3 liter diesel car. Get more than 30 starts from a fully charged power pack. Driven by a high capacity Lithium Battery; recharges more than 3,000 times! Charges nearly any electronic devices, including phones, cameras, tablets, and laptops. Ultra-bright emergency light with three settings: Steady ON, Steady Flash, and SOS. Holds its charge for 6-12 months. 3 – 5 year design life. 12V Adapter for cigarette plugs and a set of clamps. Plugs for USB, micro-usb, and other connectors. Barrel connectors for a wide variety of laptops.